Two direction derailing for 4-axle locomotives and all freight cars. Do not use if 6-axle locomotives operate on your tracks. Use two 1-way derails (one left-direction, and one right-direction) back-to-back, instead. 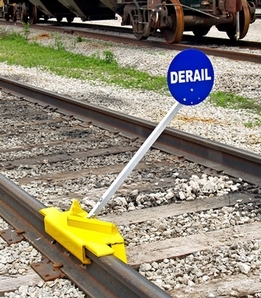 Blue derail sign and holder included with all derails.